We’d love your help. Let us know what’s wrong with this preview of That's Not a Hippopotamus by Juliette MacIver. 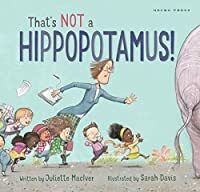 That's Not a Hippopotamus is a deft and delightful tale, packed with word play and madcap energy and with a whole different story to enjoy in the illustrations. To ask other readers questions about That's Not a Hippopotamus, please sign up. Rhyming picture book about a lost hippopotamus at a safari adventure park where a class is visiting. Of course, no one in their right mind would allow children to roam around with wild animals, especially not on a school trip. But the story is meant to be humorous rather than realistic. Some issues with both the rhyme scheme and the meter in places. The words "Miss" and "hippopotamus" are overused. Illustrations enhance the text and add fun to the reading experience. Children will enjoy locating the hippo on various pages. A class field trip to the safari adventure park makes for some good, silly fun. A New Zealand import. I love Juliette MacIver's books, there beautifully illustrated and full of the funniest rhythm's. At Don's safari understanding understand, we have every creature in the land, all roaming wild safe and free, so many beast's for you to see - That"s a lie a whopper miss, he's got no hippopotamus. This is a deft and delightful tale, packed with word play and madcap energy. "The clever rhymes are irresistible but the story has much more than that - there is real emotion here and the quiet child has a voice." This new book from an award-winning and very popular author and illustrator is perfectly pitched and full of humour and excellent wordplay. As children read the book they are challenged to find the hippopotamus that is hidden in all of the pictures and id This is a deft and delightful tale, packed with word play and madcap energy. This new book from an award-winning and very popular author and illustrator is perfectly pitched and full of humour and excellent wordplay. As children read the book they are challenged to find the hippopotamus that is hidden in all of the pictures and identify with sweet Liam, the quiet little boy that no one seems to be aware of, or worst yet, ignored. "I see him, Miss: He's super tall! I'll fetch him in no time at all. I got'im, Miss! I got'im, Miss! I KNEW that I could spot'im, Miss! A class trip to the zoo turns into a hunting expedition for a devious and prank-playing hippo. The teacher, the zookeeper and an enthusiastic pack of pint-sized students charge here and there to capture that missing beast. The noise and drama reaches a crescendo as each child thinks they have bagged the prize... the missing hippo! Poor little Liam is left out, is way behind the pack, and unheard. Clever little Liam spots the trickster every time but no one will pay any attention his contribution. Will anyone stop the chaotic search and finally listen to him? Will Liam get acknowledged and rewarded when those around him realize he is a hippo-finding-hero? "Well I never! Aren't you clever? This delightful tale will bring smiles to your face and cheers to your lips! Kids will ask for it again and again just for the pure joy of joining in the hippo hunt. This book is a perfect addition to your own personal collection, for a classroom or a library. I highly, highly recommend this book. Liam’s class is on a visit to Don’s Safari Park where many creatures roam wild and free. Although one animal seems to be missing - a hippopotamus. The hunt is on! The harried teacher tries to keep her class under control as they dash off in pursuit of the hippo. The over-excited children discover many animals, including some that terrify their teacher, but the hippopotamus remains elusive. Liam has a hunch he knows where the large animal is hiding, but the teacher doesn’t listen when he tries to Liam’s class is on a visit to Don’s Safari Park where many creatures roam wild and free. Although one animal seems to be missing - a hippopotamus. The hunt is on! The harried teacher tries to keep her class under control as they dash off in pursuit of the hippo. The over-excited children discover many animals, including some that terrify their teacher, but the hippopotamus remains elusive. Liam has a hunch he knows where the large animal is hiding, but the teacher doesn’t listen when he tries to tell her. The rhyming story rollicks along in step with the speedy searchers: "A missing hippopotamus! The trail is getting hotter, Miss! Good thing we’re here. The very best of hippo-hunters in the west." It’s a hilarious read-aloud story and could be a helpful cautionary tale prior to a class outing. Perfect in all respects, a worthy winner of the New Zealand Book Awards for Children & Young Adults as best picture book of the year! The text rhymes delightfully and the illustrations are so cute, as the reader follows a group of small children with their teacher at the zoo. There's even the added extra of spotting the missing hippo as each animal is revealed. This book is so fun. A class visits the zoo and the hippopotamus is missing. They go looking for it, claiming to have found it on every page but...it's not the hippopotamus. Only little Liam sees him. My four year olds loved finding the hidden hippo on every page and there was a lot of laughter. Perfect late preschool/ kindergarten book. When the school class visits the animal safari, they want to see examples of ALL animals. There are a lot here, but where is the hippo??? Never fear. With the help of the intrepid Liam, the hippo is found. I loved the illustrations. The kids are adorable! A deliciously screwball- and beautifully illustrated- picture book about a class trip to the zoo that goes awry when a hippopotamus goes missing and a classmate who keeps spotting the missing creature can’t get a word in edgewise. Very, very funny and offbeat! Fun to read aloud, and kids ask to "start over again". An example of incorporating highly diverse group of young kids in ways that suggest true culturally distinct differences rather than just various shades of skin tone. This story highlights the importance of not ignoring children in your class, because they all have a right to make a contribution, which the teacher should value. Furthermore, the story and it's illustrations, provide a humorous tale with lots to talk about. Cute story, too bad it celebrates zoos. Would not use. What a funny book! I laughed so much reading it and seeing all the animals the children thought was a hippo. I feel that ages 7 and up will like this book and laugh as much as I did. Excellent illustrations and details here. I like how the kids all have a lot of personality and expression in their faces and body movements/positions. AND OF COURSE, the hippopotamus is outstanding. An absolute delight. This story of the missing hippo will have you giggling all the way through as you see the hidden hippo throughout. Love it! With the onset of TV, the internet and colourful books we take for granted that we know what different animals look like. A giraffe has a long neck, a lion has big teeth and a Dodo does not look like much anymore. However, imagine a time before all this technology, the closest you would get to an exotic animal might be the assorted stuffed creatures in a local Natural History Museum. 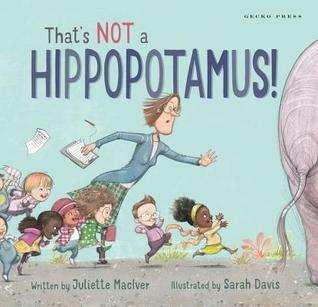 Perhaps the children of Juliette MacIver and Sarah Davis’ ‘‘That's Not a Hippopotamus!’’ learnt from some poor ta With the onset of TV, the internet and colourful books we take for granted that we know what different animals look like. A giraffe has a long neck, a lion has big teeth and a Dodo does not look like much anymore. However, imagine a time before all this technology, the closest you would get to an exotic animal might be the assorted stuffed creatures in a local Natural History Museum. Perhaps the children of Juliette MacIver and Sarah Davis’ ‘‘That's Not a Hippopotamus!’’ learnt from some poor taxidermy, as they sure don’t know what a Hippo looks like. There are several elements that must all work together to make a great children’s book and whilst ‘‘Hippopotamus’’ has some of them, it does not feature all. On a positive note, this is a very attractive book. Davis’ illustrations are fantastic. Each page is packed with things to look at, such as small animals in the background. The characters are wonderfully realised, the children in particular are cute and very amusing. The book itself also has a solid central idea – mistaking one animal for another. This certainly leads to some funny moments as the children turn up with outlandish animals that could not possibly be the right answer. Davis adds even more fun by having a particularly rotund stranger hanging around in the background looking a little suspicious and Hippoesque. With all these elements in place ‘‘Hippopotamus’’ should be a no brainer, but unfortunately the text just does not scan very well. The premise with MacIver’s words is that Miss links loosely with Hippopotamus. You are jarred into saying it almost every double spread and it does not sit well. A small child will even be able to pick up that you are struggling a little to make the words mesh. Rhyming couplets and word games are the foundation of many fantastic children’s books and they are a building block of the genre. To build your story on poor foundations is never going to work. This book was laugh out loud and toddlers will delight. A class field trip is almost ruined when the hippopotamus goes missing. C an the class find him? Don't forget to look in every picture! I love that the hippo is actually hiding in every spread, and the dust jacket is AMAZING. The endpapers, too, are pretty awesome. Cute end papers and a repetitive phrase may make this a fun one to read aloud. The illustrations are lively. I was hoping for better rhymes, ala Nanette's Baguette. Instead you get a heck of a lot of Miss and Hippopotamus, and some other rhymes that threw me off with their unexpected pronunciations. Don't really know how I feel about the teacher ignoring Liam the entire way. I like the pictures and the overall story, but the writing let me down. Pleasure to read the rhyming meter - give to fans of I Ain't Gonna Paint No More! Is long for young storytimes but great for 4 years and Kindergarten as a read aloud. The repeated line That's NOT a Hippopotamus! is perfect for participation. Young readers can join the field trip and look for the hippopotamus with the kids of story. My favorite hiding spot was when the hippopotamus had a striped sock and on his nose to blend in with the elephants. A fun rhyming story with clever ways to rhyme "hippopotamus." Thought it sounded like a good one for storytimes, but print too small as are the key parts to the story, and rhyme just not good enough for me NOT to constantly trip over! Fun rhymes, repetition, awesome artwork.